Details: The bottom seems to have fallen out of the model bus market in recent years, with both EFE and (particularly) Corgi releasing far fewer new models. Prices also seem to have shot up, which could be either a cause or an effect. Conversely, relative newcomer Oxford Diecast has produced a huge number of modern and vintage car, van and lorry models, and has also diversified into railway rolling stock. Among recent releases are three in 'service vehicle' liveries, all to OO scale (1:76). The recent open day at Barking gave me the chance to buy these for just £4.50 each. 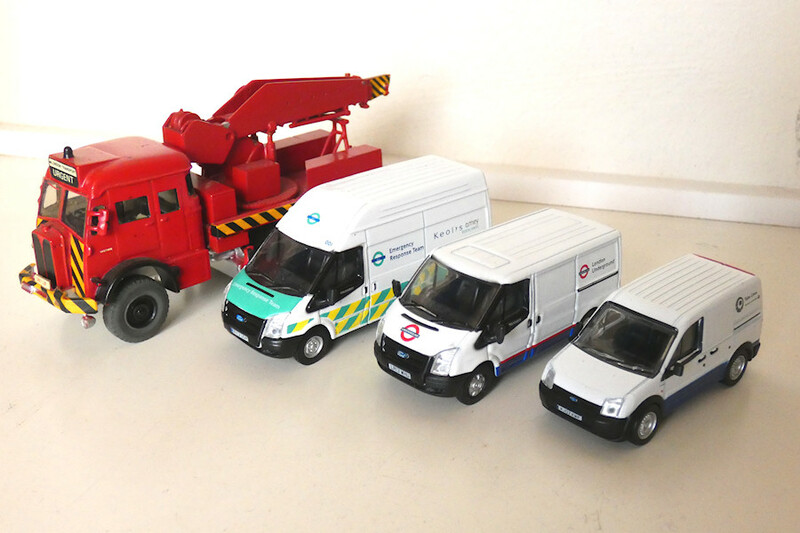 Shown here are the three Ford vans, comprising (left to right) a high-roof Mk.7 van in DLR Emergency Response livery, a low-roof Mk.7 van in standard LUL livery and a Transit Connect Mk.1 in Tube Lines livery. Photos of the actual vans these are based on are all available on LTSV and links have been added to allow comparison. From the front, everything looks good, although the middle van does not have fleetnumbers applied (which the Connect does). Completing the line-up is a kit-built model of an AEC Militant recovery truck which I bought (already made-up and painted) a few years ago. Curiously this is lettered as 1456MR on one side and 1457MR on the other, but in all other respects it is identifiable as 1457MR.